Write For You Calligraphy is "right for you," if you are searching for that touch of elegance to add to your special occasion. I invite you to walk back in history and recapture the classic look that only hand penned calligraphy offers. Whether to adorn envelopes or add elegance to your wedding reception; hand calligraphy will show your guests that little things add up to lasting impressions. 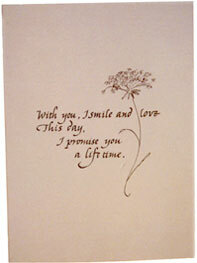 I like to think that the dreams for your perfect day can be outlined with each calligraphy pen stroke. I will customize your dreams and ideas, from "Fantasy to Sophisticated" and bring about a unique product that is sure to capture "the look" you have been searching for. These three words are used most often when customers refer to my finished calligraphy items. From the simple place cards to the most elaborate Guest Seating Scrolls: each one is done with the same amount of precision and care. View Samples for some great ideas! A scheduled meeting to plan calligraphy for your occasion is desired, but email and phone calls have been successful, if you are unable to visit me at my studio. I have worked in the lettering arts field for over 20 years. At the present time, I have been enjoying the opportunity of working at calligraphy on a full-time basis. Although calligraphy for weddings is my primary focus, the art of calligraphy is always bringing interesting avenues to explore, such as, awards, announcements, personalized wedding gifts and other special occasions for private and commercial uses. My studio is located in a renovated 1760 New England barn located in Marlborough (west of Boston) that has been in my family for almost 60 years. I will be happy to handle orders from out of state via US Mail, FedEx or UPS. If you live within the Metro West area, you are welcome to visit my studio or drop off any materials at my business address by prior arrangement.